RESTON, US: comScore, a leader in measuring the digital world, today reported holiday season retail e-commerce spending for the first 46 days of the November-December 2012 holiday season. For the holiday season-to-date US$35bn has been spent online, marking a 13% increase versus the corresponding days last year. 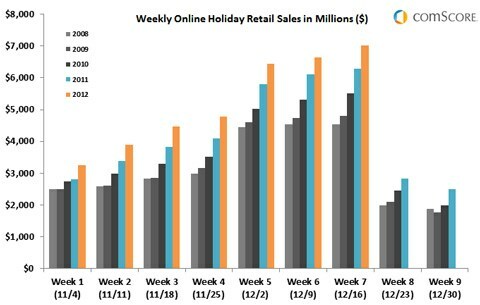 The most recent week achieved record-setting levels of online spending, eclipsing US$7bn in sales for the first time ever. Four individual days surpassed US$1bn in spending, led by Green Monday at US$1.275bn. "We expected this past week to be record-setting and it clearly was, with an impressive spending total of more than US$7bn - an average of more than US$1bn in spending per day," said comScore chairman Gian Fulgoni. "This current week, which kicked off with Free Shipping Day on Monday the 17th, will be critical in making up some ground on a season-to-date growth rate that remains below initial expectations at 13% following a prolonged post-Cyber Monday lull. With many retailers extending their free shipping offers into Tuesday and Wednesday of this week, we just may see the sort of late-season jolt needed to push growth rates back into the mid-teens."